Chamonix, an impressive French valley, is best known as a bustling Alpine Ski Town visited in winter by a large number of people who make the journey to take advantage of the prolific snow falls and social après festivities. On the other side of winter though, there lies a season just as impressive in what it can offer those who have a taste for summer time mountain living. Arriving in Chamonix at night set me up for one of the most impressive vistas to wake up to that I have ever experienced. After a short bus ride from the Geneva airport in Switzerland, and a friendly late night check-in to the well priced accommodation at the International Ski School accommodation, I put my head down to make sure I was fresh to explore first thing the next morning. First light is gallantly blocked by the many gigantic peaks surrounding the valley. It only manages to infiltrate some time after sunrise, but when it does, wow, the spectacle before you is one of power and awe! It’s from an incredibly close proximity that the Mont Blanc Massif slopes rise directly from the Southern border of the town and sharply make their way skyward to separate the awe inspiring steep grey slopes, from the bright blue sky forming a canvas for those pristinely snow capped peaks that have lured of so many adventurers over the years. It’s an exhilarating spectacle to stay in a town that feels so much a part of the mountain and to have such natural beauty so close by… with all this grandeur ready to adventure in, I went in search of ice-cream and beer. 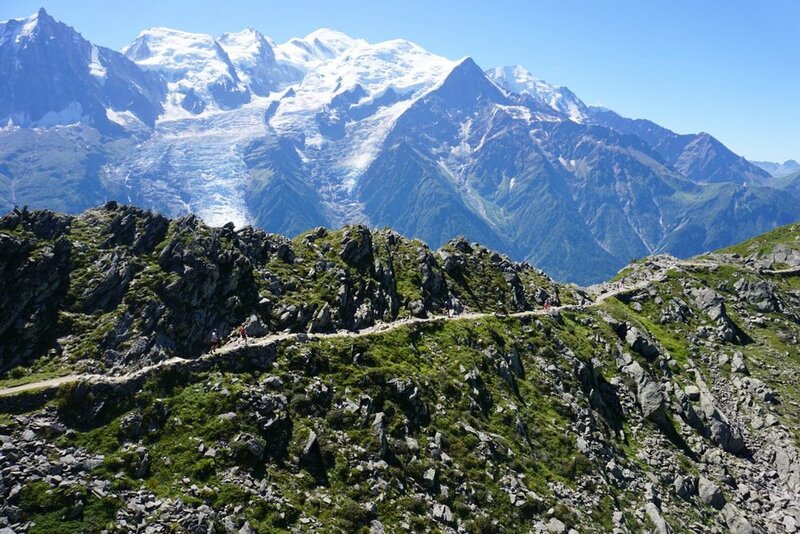 I was in town at the same time as the most prestigious trail running event of the global calendar, the famous Ultra Trail Mont Blanc. There are thousands of people in town. They’re here to run the race, or perhaps support a friend or family member who is taking on the challenge. The build up to the weekend’s race sees mountain lovers taking part in shorter iterations of the weekends 160km main-show, but even without the race, there are a huge number of people in the area who are there to experience one of the many mountain activities, or just enjoy the beauty of the bright, fresh, historically rich scenery which presents itself around every turn. With the big crowds though comes the challenge of knowing where best to hang out, fortunately my buddy Kane had been lapping up all Chamonix had to offer and was happy to meet for beers. His local spot, Elevation 1904. We sucked back some beers to catch up, washed down with a burger and then hit the streets to take in some more local flavors, this time Gelato. It was a great introduction to the town and it was only the next morning, that I noticed how many healthy looking older people were out and about, mixing it up with the younger lot. Groups of three or four women in the 70’s were eagerly traipsing their booted legs towards a ski lift or mountain trail with definitive purpose, and a confident, experienced look to accompany the sparkle of adventure in their eyes. It has a lot to do with the ease of access to the mountain that keeps summer revelers coming back in their droves. My second morning and I decided I had better do something active so I grabbed some fresh fruit, cheese, and bread from a basic super market and headed upward, to the trails. My first taste of taking on the challenge of the steep and unforgiving single track was as tough as I had imagined, but once through the tree line, with the vistas of the opposite mountain ranges opening up, and eventually, a skinny dip in a glacial lake at the top of my chosen route, and it became all too easy to see why Europeans of all ages keep coming back to what a travelling buddy calls, “the Disneyland of trail running”. I loved it in those mountains, but with so much action going on in the town for the UTMB races, and the lure of delicious cheese, heavy artisan breads, and the most glorious ice cream flavors to experiment with at least twice a day, it was as much of an adventure just cruising the streets of Chamonix and it’s neighbouring towns as it was up in the mountains. Nearby Courmayeur is a charming neighbor to Charmonix. While investigating the twisting streets, I came across a postcard looking chapel. Skulking in for a closer inspection I realised there was a wedding taking place. I love how, in small towns in Europe, many of the residents come to pay their respects and satiate their curiosity at the wedding service. Whispering old ladies were patiently sitting on the wall of this particular church, until the newly married couple exited via a huge heavy door that looked older than even the geriatric onlookers. The giddy shuffle from the chapel accompanied by bells to announced the joyous occasion, and I moved closer to the ornate piece of architecture to get a closer look at what freshly married French people look like, nobody even raised an eyebrow at my joining the gathering. I thought about moving along with the wedding party to sample some French wine, wedding cake, and perhaps a bridesmaid or two, but I had my own, far less matrimonial engagement to make, as I my buddy Ryan was coming over one of the peaks surrounding Courmayeur and I needed to get him a feed at the aid-station to help him onward in his 160km race. The race is brutal and it didn’t go well for my buddy, instead of getting too low though, he just vows to come back and do it all again. Ultra distance runners are nutters, and if you know one, I have no doubt you’ll agree. With my eyeballs filled up to the brim with everything running, it was refreshing to get a message from new friends in Geneva (met Nic and Mel on my stay over en route to Chamonix and that’s another story – include hyperlink to Geneva piece) asking if I would please look up a pair of Parisian living American women who were in Chamonix for the weekend. A couple of brief whatsapps and I found myself walking into the coolest bar in town. In winter it’s the hot spot for Apres Ski vibe, but now it was not nearly as busy, still, it would be interesting trying to pick out my rendezvous deux amongst the rest of the patrons. After just a handful of darting glances left and right, I was drawn instantly to the two making the far end of the bar counter look a whole lot livelier than the rest. About to happily make my way over to them, I was thrown a curveball after spotting another two women closer to my current path. Dilemma. I wanted to pick the correct two out right away and had not had enough time to social-media-stalk the two beauties. I decided to go deep and was received by two, choice confirming, huge smiles, which welcomed me in warmly for the rest of the night. Their stories are entwined and fascinating. The one I reciprocated was probably pretty spicy too, I’m not sure what I delivered, but we all got each other, and, as is the case in travelling, a little more time would have been more than welcomed. Definitely not the last I’ve seen of Megan and Maggie though, you might get to see them too if their recent pitching of a series (about their lives and random experiences such as the one I was living out with them in that very moment) makes it to fruition. How to get there: Lufthansa and Swiss International Airways fly direct to Frankfurt and Zurich respectively and from there it’s a scenic train ride to Chamonix. Or fly Via Duabi on Emirates to Geneva , followed by a short transfer to Chamonix . Where to eat: Burgers and beers at Elevation 1904 was our staple every evening with friendly staff, fellow travelers, and prices. Gellato from the street vendors and side stalls was an imperative dessert. Where to sleep: AirBnb is a great option to find a place to stay and has been adopted to great effect by houses, hostels and small hotels in Chamonix so there is a lot of stock available. Local things to try: Climb the wall, eat a wedge of fresh Saturday morning market cheese, take aski-lift ride to the glacier and camp on the mountain is good weather.